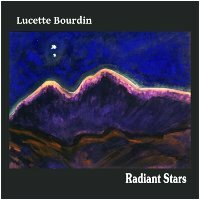 Lucette Bourdin returns to Earth Mantra with her latest release Radiant Stars, the conclusion to the breathtaking trilogy of albums that includes Silver Moon and Golden Sun. And what a trilogy these three albums represent. By themselves, any one of the three could easily be considered a masterwork, but taken together they are simply an astonishing achievement, one of the great collections of ambient music of all time. In particular, Radiant Stars is one of the deepest and most elegant ambient releases we have ever heard. Three magnificent and extraordinarily patient pieces await the listener, the shortest of which is over fifteen minutes long, and the longest of which spans more than a half an hour. To call the music immersive is to understate the case. The music is restful and soothing, lush and contemplative, but with the perfect amount of activity and tonality. Amazing work. Listening to pieces like Look Up to Outer Vastness, one is struck by the sheer virtuosity Lucette brings to ambient music. She very well may be one of the best ambient artists making music today. Why she is not releasing albums and scoring films at the highest levels of the industry is completely beyond comprehension. Simply immaculate music, performed by a master of the genre. Earth Mantra is very proud to be bringing her music to our listeners, and we look forward to many more releases from her in the future. Wonderful, beautiful soundscapes. I like this album :) those drifting minimal pads in the middle of second track are amazing, inspiring me to create music myself.